The smartphone platform in general is aimed at teenagers and adults who own their smartphones. However, the platform is quickly growing into a great place for kids with a selection of apps and games that cater to younger minds along with hardware specifically geared toward kids. Today we are here with game app for kids that along with entertainment will also help you to educate your kid. We are talking about, Flying Chick2 for kids. 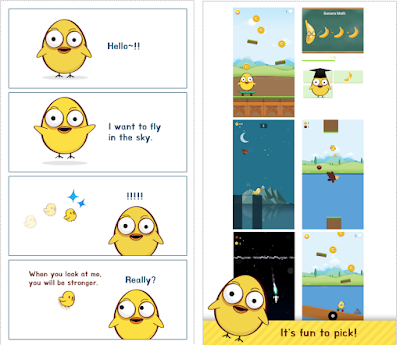 Flying Chick2 for kids is fun and action type of arcade game, which revolves around the storyline of a chick who wants to fly in the sky. In this world he is alone and you are the only person to take care of his food, his cleanliness, sleeping and help him to take his first flight. Controls for the gameplay are very basic and simple one-tap controls. · Best graphics: with nature defining theme, rhymed sound in the background. · Achieve different levels by earning points. · 6 in-built addictive and challenging mini games. · Complete different achievements to get many rewards. · Help your kid to learn basic arithmetic calculations.